A good winter-feeding strategy not only conserves forage supplies but also improves soil fertility, which saves on input costs. The author is an extension beef cattle specialist with the University of Kentucky. The beef industry has been an extensively managed production system for decades. Small profit margins have supported the necessity to minimize input costs. Economists in Texas reported the net income per cow over the years from 1991 to 2009, which included 462 herds, was a loss of $58. The Standardized Performance Analysis data improved for the years 2012 to 2016 with an average net income near $160 per cow. This demonstrates the drastic year-to-year variation in financial returns for beef enterprises. Management decisions tend to be dictated by previous years’ financial outcomes. Often, pasture inputs are the first to get the axe when we begin to chop away at expenses. This is because lime and fertilizer are an immediate out-of-pocket cost. Additionally, pasture yields are not routinely measured and the impact of low fertility is not readily observed. Reduced soil nutrient levels may not be recognized until undesirable plant or weed populations begin to establish. Competition from undesirable plants poses a problem, as desirable forage availability is key to maximizing dry matter intake and, in turn, animal performance. Reduced economic returns can have a downward spiraling effect on the operation. Is there a simple way to offset this economic impact on pasture fertility? Managing how conserved forages are fed through the winter period may help. Hay is a source of nutrients. For instance, grass hay may contain 0.25 percent phosphorus and 2.25 percent potassium on a dry matter basis. A ton of this forage would contain the equivalent of 10 pounds of phosphorus as P2O5 and 48 pounds of potash (K2O). In many instances, the potassium and phosphorus levels exceed the recommended dietary needs of beef cows, especially dry, gestating cows during the winter. Excess nutrients are excreted via feces and urine. On-farm demonstrations in Arkansas revealed improvements in soil nutrient levels from hay feeding, ranging from 206 to 928 pounds and 854 to 2,793 pounds per acre for phosphorus and potassium, respectively. North Dakota researchers observed higher crude protein in forages collected near bale-feeding zones compared to areas that did not have hay fed. Soil data revealed soil nitrate-nitrogen levels were three to four times greater in hay-feeding areas while potassium levels were 400 to 600 pounds per acre greater at distances 2.5 feet to 12.5 feet from the bale center. Feeding decisions that distribute animals more evenly across the landscape can improve the utilization of these nutrients and potentially boost soil nutrient levels. Moving hay-feeding stations across fields is one method to achieve a more uniform distribution of nutrients. Bale grazing is a strategy that is gaining popularity in the Northern Plains region and Canada where the ground freezes during the winter. This feeding strategy involves setting out the hay in advance of when it is to be fed to limit the need for driving the tractor over the pasture area during winter. Bales are arranged in rows and temporary electric fence is used to control animal access to the hay. As the cows consume bales, the electric fence is moved to the next row of bales to give access while feces and urine is deposited more uniformly across the hay feeding area. Our experience with bale grazing in the upper Southeast is that it is more challenging due to higher precipitation, but it’s not impossible. If this seems a bit too far of a stretch for you, consider moving the hay rings every time you feed hay and keep a distance of 30 to 50 feet between feeding spots, spreading out nutrients over a larger area. Another method of feeding hay that spreads animals and manure nutrients over the feeding area is unrolling hay. This is common in the Southeast due to the high winter precipitation received. Hay waste is greater when unrolling hay and will require additional stored forage. Feeding losses add nutrients, and in some cases, seed to the feeding areas. Unrolling hay is not too different than swath grazing practiced in the Northern Plains states and Canada. The difference is with swath grazing the forage is not removed from the field. Swath grazing is not common in the Southeast due to the higher precipitation received that leads to excessive losses from rotting. Grazing stockpiled fescue is a great alternative to swath grazing when timely rain in the fall supports forage growth. During winters with excessive precipitation in the Southeast, mud is the biggest challenge when feeding cows in the winter. One solution to alleviate mud problems is to feed on a hard-surfaced pad and collect manure nutrients. The collected manure and hay lost from feeding can be spread on fields as weather permits. Feeding pads can be constructed of geotextile fabric and dense-grade gravel or concrete. 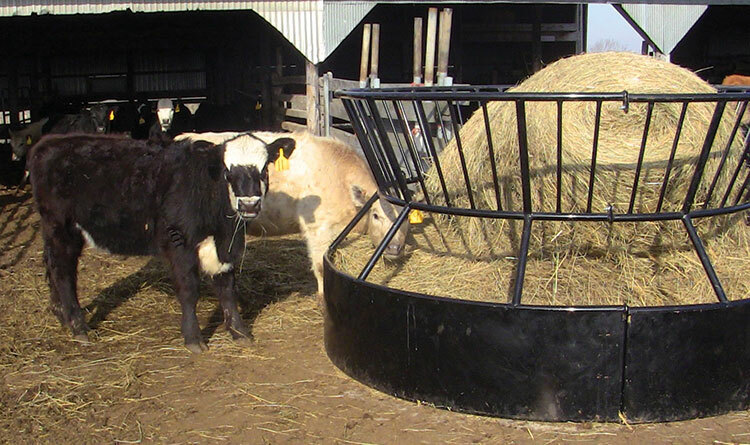 The feeding pad may be as simple as a large area to place hay rings on or engineered structures with concrete flooring that contain permanent feeding racks. Routine scraping and collection of manure and hay is needed. Access to a manure spreader is also needed to maximize nutrient utilization. Manage winter hay feeding to capture value from manure and hay losses. These nutrients can improve soil fertility and forage production the subsequent season. As net income weakens for beef operations, every penny counts. Consider that beef cow as a fertilizer buggy and keep her moving across your fields, or at least collect and spread the manure on fields later in the spring. Here’s hoping to an early green up. This article appeared in the February 2019 issue of Grower on pages 18 and 19.